Spinal cord stimulation (SCS) is a treatment employed to help alleviate lower back pain and other central nervous system related problems that have failed to respond to other treatments. When a doctor and patient decide to try SCS for pain relief, a trial period will first be attempted. The physician will start by inserting a temporary electrode with an attached control device into the individual’s skin. 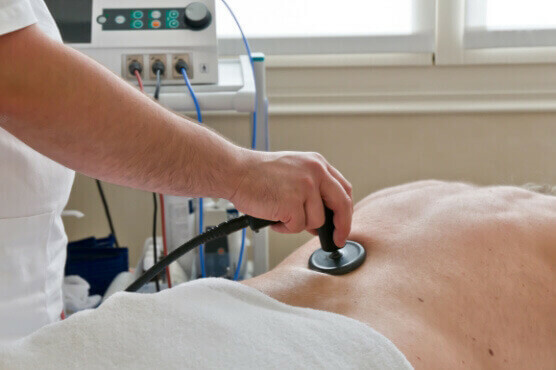 The person will be able to adjust the electrical pulse strength that is emitted through the electrode in order to find a level at which pain relief is achieved. If the individual finds that the therapy is effective, the doctor will schedule a time to surgically insert a permanent device. How Will it be Implanted? Typically, an individual will need only a local anesthetic when the physician implants the device, and the patient will also likely receive a mild sedative to promote relaxation during the procedure. A small incision is made, and then the unit is implanted under the skin, and wire leads are positioned into the epidural space, or air pocket, in the spinal column. After the physician and patient determine a therapeutic pulse rate for the device, the individual will use the unit three or four times a day for period of one or two hours per session. A tingling sensation is felt when the device is on, and patients can turn the power off to the unit as well. In severe cases, Santa Monica spine surgery can be a good option to find relief. This minimally invasive, non-fusion procedure is one of the many options that have been made available to patients thanks to technology and advancements in the spine surgery field. To learn more about SCS or other options for minimally invasive spinal surgery in Santa Monica, call (310) 828-7757 and speak with the spinal specialists at The Spine Institute Center for Spinal Restoration today.